Thousands of young people have been sent fake scam text messages by the Office of Fair Trading (OFT) to warn them about con-artists. The campaign saw 25,000 mobile phone users aged between 18 and 24 receive a message telling them they might have won £1,000 in cash. But a second message arrived soon after informing them that the message was a fake and warning them about scams. The OFT estimates that 6% of scam victims are aged between 16 and 24. The Information Commissioner's Office provided the OFT with numbers of 25,000 young people who have opted to receive marketing text messages. As part of the OFT's Scams Awareness Month campaign, it sent texts to all these numbers on Friday. The text reads: "Urgent! U may have won £1k cash with '2 Good 2 B True'." A second text followed shortly afterwards that made clear that there was in fact no prize, and that it was simply a warning about scams. The message also highlighted SMSus, a new text message service from PhonepayPlus, the body which regulates services bought by phone. 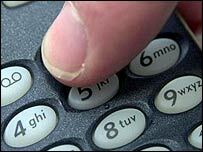 This allows users to text details (to 76787) of a premium rate number or shortcode they are suspicious about. An automatic reply lists the cost of the number, details of the service provider, how to contact them and how to complain if necessary. The service is free for most people, but will cost no more than 12p. Mike Haley, director of consumer protection at the OFT, said: "Young people can fall for exactly the same types of scam as anyone else, often delivered through the latest technology. "We hope that our innovative approach of sending fake scam text messages will remind young consumers to be on their guard if they receive a suspicious offer." Trays O'Reilly, director of standards and communications at PhonepayPlus, said: "More and more people are using mobile phones to pay for a range of products and services and in most instances this happens without problems. "Our job is to crack down on scams and other misbehaviour when it occurs so that everyone can use phone-paid services with confidence." According to the Mobile Data Association, 95% of 16 to 24-year-olds use text messaging regularly, each sending an average of 100 texts per month.